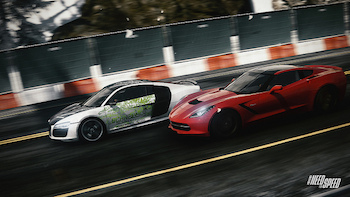 Rivals steps up to fill the racing game-shaped hole in the console's day-one lineup. Need for Speed: Rivals will hit stores on PlayStation 4 a week ahead of schedule to join the console's day-one launch lineup. Rivals, EA's upcoming cross-gen entry in the annual series, was originally set to hit stores on all consoles - PS4, Xbox One, PS3, Xbox 360 and PC November 22. The current-gen console and PC versions will still hit stores on November 22, alongside the launch of the Xbox One. Rivals fills a critical gap in the PS4 launch lineup. With both Sony and Ubisoft's racing titles -DriveClub and The Crew respectively - pushed back in the last few months, the PS4 was set to launch without a racing game. Where's Ridge Racer when you need it? The PS4 version of Rivals will support remote play on the Vita, and AllDrive Mode, a seamlessly integrated single and multiplayer experience.